This chutney is a unique and rare Bengali dessert. 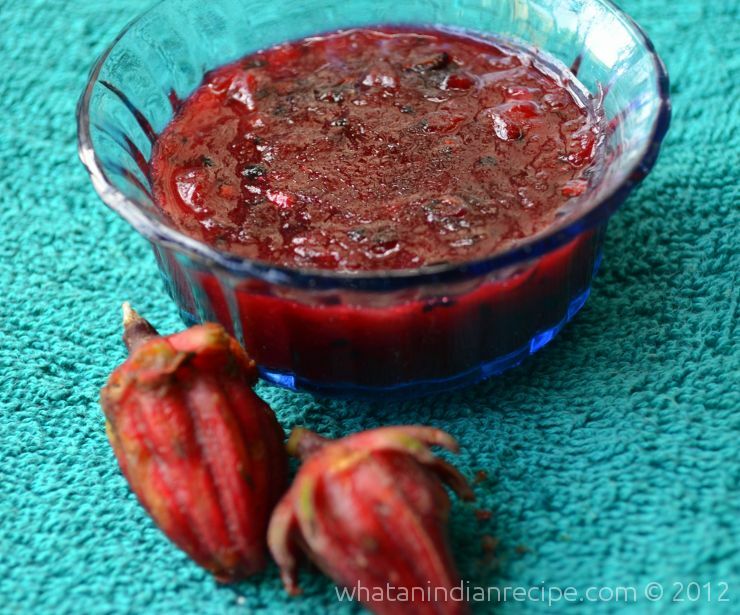 Roselle Hibiscus is beneficial fruit, this is a must try for foodies.It known by various names, region-wise it would look something like this, Belchanda in Nepal, Tengamora in Assam and mwitha among Bodo tribals in Assam, Chukor in Bengal, Gongura in Telugu language, Pundi in Karnataka, Ambadi in Marathi, LalChatni or Kutrum in Mithila, Mathipuli in Kerala, chin baung in Burmese, KraJiabDaeng in Thai, som phor dee in Lao PDR area, bissap in Senegal, Guinea Bissau, Mali, Burkina Faso, Ghana, Benin and Niger, the Congo and France, dah or dah bleni in other parts of Mali, wonjo in the Gambia, zobo/Ishapa in western Nigeria, Zoborodo in Northern Nigeria, Chaye-Torosh in Iran, karkade in Egypt, Saudi Arabia, and Sudan, omutete in Namibia, sorrel in the Caribbean and in Latin America, Flor de Jamaica in Mexico, Saril in Panama region, grosella in Paraguay, rosela in Indonesia, asam belanda in Malay. In Chinese it is called Luo Shen Hua. Clean the tok bhindi/Roselle Hibiscus fruits and take only the outer red part of the fruit (calyces of the Roselle Hibiscus) discarding the inner seed and also the stem. Then slice the outer cover in to thin pieces and keep aside. Heat oil in a kadhai/pan and add the paanch phoron and allow it to splutter. Now add the sliced tok bhindi and mix well. To this add very little water and allow the fruit to cook. When the fruit turns soft add the sugar and mix well. You will see that the chutney takes a thick jelly like form. Remove from fire. Serve after a hearty meal as dessert.